It looks a lot like a kite but the Fly F-A-B Chair is actually a wing-inspired chair that can be considered for any home or office. The Fly F-A-B chair comes from Farg & Blanche, offering a futuristic looking chair that should serve the expected functionality chairs would normally do. Lamps don’t get any simpler than this. Although this pendant lamp seems to be a bit sophisticated, would you believe that it took only a single piece of paper to produce it? In some sort of a twist, here is a clock that makes use of odd looking clock hands in the form of batteries. Batteries are normally used as sources of power for gadgets and clocks but this is one instance where some creative minds tweak common designs like clocks a bit. The only twist here is that the batteries are dual purpose. While they do act as clock hands, they still power the whole thing. A neat clock to have for a unique type of a home don’t you think? As far as ink cartridges are concerned, the usual routine is to recycle them or have them refilled. But for the creative minds, here is a new way to make use of those empty printer cartridges, an ink cartridge lamp that should be add some ambiance to the ordinary room. Cardboard use has been the common thing we see these days and it looks like people are getting quite creative with them. 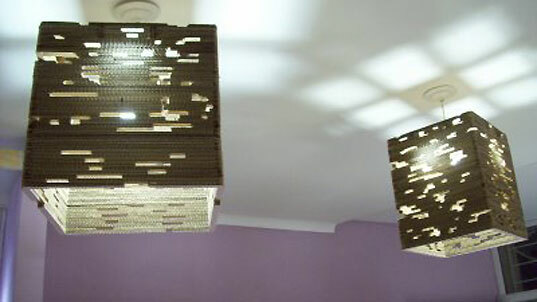 Ranging from the standard magazine racks, lamp shades and even chairs, it seems that cardboard use has been inheriting the creative minds of people towards being more eco-friendly. Among the people leading the pack are Santiago Morahan, who has come up with a Garbage Collector Design (Diseno Cartonero) that will surely make your eyes pop. Living in an apartment may be the closest thing that people can get towards great homes. Many would find it a waste of time but for people who want to make the A-grade of living conveniently, resources such as books may be your best recourse such as this one by Maxwell Gillingham Ryan, Apartment Therapy Presents.